Though previously unfamiliar with Glen Weldon, a friend recognized my love of Batman and recommended I read this historical overview of the famed detective. Of course, any item pertaining to Batman generally makes me happy, so I immediately checked The Caped Crusade out from my local library and set to work. Weldon uses a highly entertaining writing style. He is an articulate and expressive author with a fun, even humorous, voice. While delving deep into the history of Batman beginning in 1939, he also offers analysis as to why the character survives – even thrives – year after year, decade after decade. This blend of scholarly prose mixed with awfully funny asides makes for an engaging, informative, and amusing read. Fans of all eras will devour this piece. Of course, as it probably stands to reason, I became most interested once he hit the 1980s. As a forty year old, it was thrilling to remember the comics I enjoyed as a child viewed through a historical prism. Another aspect of the book riveted me. 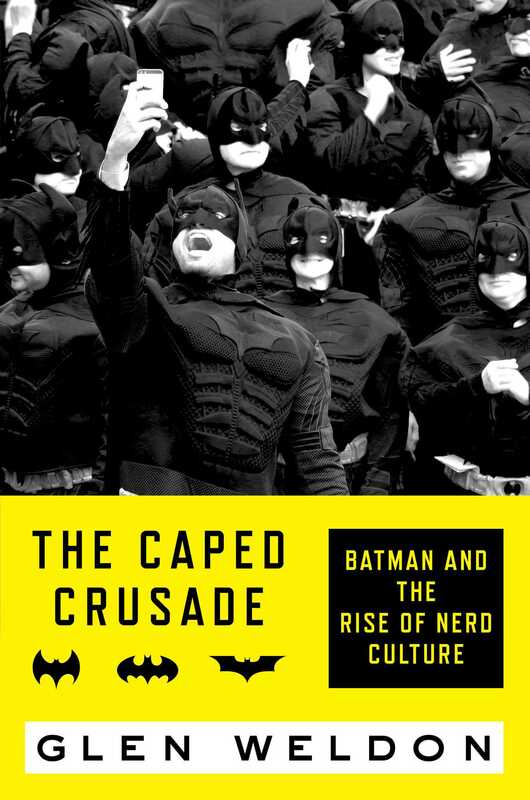 The subtitle of The Caped Crusade is actually Batman and the Rise Of Nerd Culture. Weldon correlates Batman with his most rabid fans from the early days all the way to present. Of course, anyone with Internet access knows how ugly the comment sections and message boards can be, and Weldon offers insight into why and how “nerds” came to such a state. Most interesting, though it’s easier than ever to spout off, “nerds” have been raving about The Dark Knight as far back as the 1950s, just through different means. Weldon also embarks upon a fascinating angle dissecting those “nerds” who love to anonymously threaten others via the Web. He only touches upon the topic, relatively speaking, but it’s clearly something we, as a society, need to reflect upon. I think he would agree that this goes beyond just “nerds” venting in animosity. Yes, there are those who take it way t0o far when they see a “Batman” they don’t like, but such vehemence is not contained to comic book characters alone. Politics, sports, movies, celebrities … there is a culture taking these things far too seriously to the point of threatening bodily harm, even death, to those in disagreement. I would love to see him devote an entire book to this culture in a broad sense and not regulate it only to the Batman “nerds” within the faction. If you’re a Batman fan, I know you’ll enjoy this book. Much of it I knew already, but Weldon did introduce some new information I’d never before encountered. And even though I already had most of the facts, the lens through which he delivered it made it all feel fresh, new, and, most importantly, fun. This entry was posted in Book Reviews and tagged arts, Batman, Book Reviews, books, enterainment, glen weldon, nonfiction, reviews, the caped crusade.